← Unwanted Worksheet Events? Maybe SpecialCells() Is To Blame! In a previous post I wrote about how to add minimize and maximize buttons to a VBA userform. A necessary part of that process is to get the handle to the userform’s window, but the focus of that post was how to correctly declare the GetWindowLong() and SetWindowLong() API calls across 32-bit and 64-bit environments. 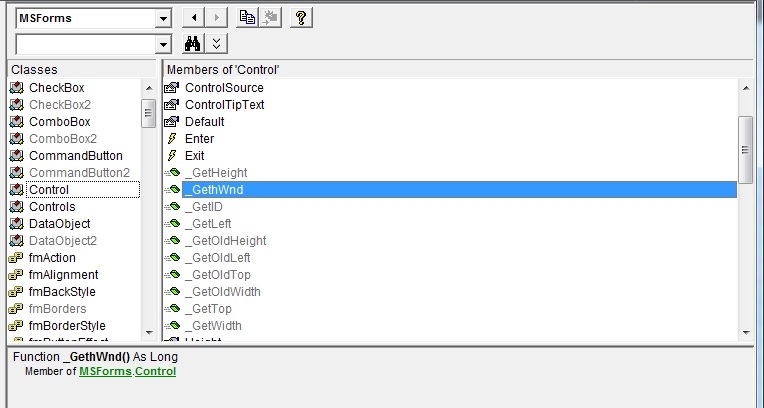 Today I’m going to look at getting the hWnd of a userform in more detail. A handle to a window is also called an hWnd. We quite often need the userform’s hWnd so we can use Windows API functions to give the userform features which aren’t available out-of-the-box – such as the minimize and maximize buttons illustrated on that other post. 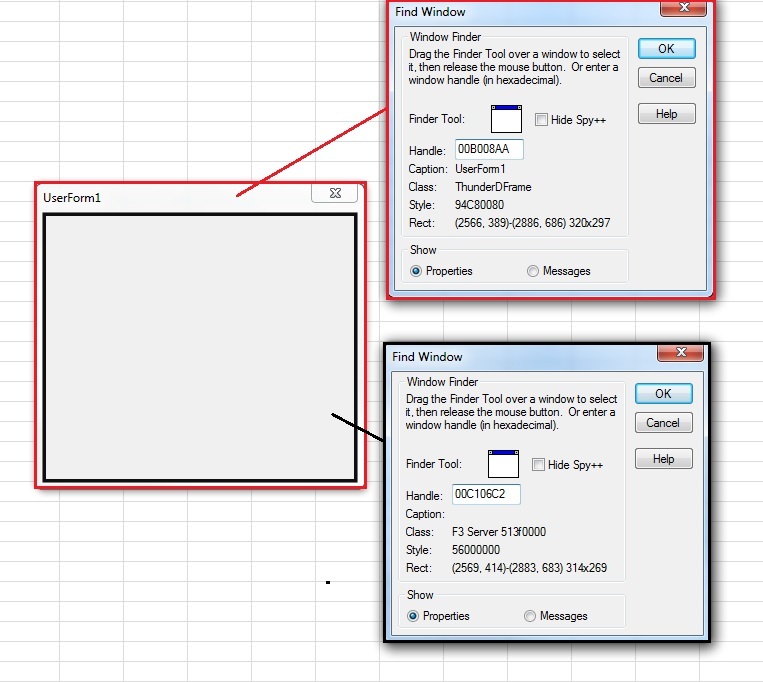 The red, “wrapper” window has a ThunderDFrame class (ThunderXFrame pre Excel 2000). When we talk about getting a userform’s hWnd, this is the window handle we’re looking for. 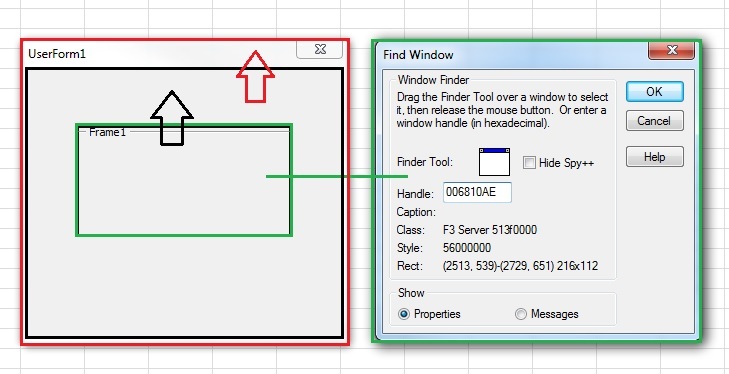 The code gives the userform a temporary, random (and hopefully unique) caption to ensure that the FindWindowA() function gets the correct window. You could go to town with ways of guaranteeing it is unique but, for me, just using the Rnd() function is more than sufficient. A nice feature about storing it in a module level variable is that you don’t need to worry about state loss clearing the variable: if a state loss event occurs then the entire userform object will be destroyed anyway. The hWnd property naturally lends itself to being read-only because it is set internally and will never change. The above code will work perfectly fine and you can implement it in every userform that needs it. However, it would also be nice to have a generic function in a standard code module that accepts a reference to a userform instance and returns back the hWnd. For all of this to work the frame control must be visible, so I slip it off to the right of the visible area of the userform before making it visible to avoid it flashing up in front of the user. Finally I clean up and delete the temporary frame control by removing it from the userform’s Controls collection. This entry was posted in Microsoft Excel and tagged FindWindowA, Handle, hWnd, MSForms, Userform. Bookmark the permalink. Note that this is one of those dll functions that are exported by its ordinal number. You would expect this to conviniently work for getting the hwnd of other windowed COM objects such as the much needed hwnd of a workbook window but unfortunately it doesn’t .. Only works for a limited number of Interfaces . That’s very cool, Jaafar – I certainly hadn’t seen this one before. Thanks for sharing it! i need the handle of Frame on Worksheet and not userform, please.